This week, the slow and steady roll-out of Apple Maps transit data continued, adding the second-largest city of Canada, Montreal, to its lineup. Multiple AppleInsider readers wrote in to note that they could now access public transportation data within Montreal's city limits. Montreal is now the second metropolitan area in Canada to gain Apple Maps support, joining Toronto, which was a launch city in 2015. The addition of Montreal comes one month after transit directions launched in Austin, Tex. That was timed to debut just before the city's popular South by Southwest festival. When it launched with iOS 9 last year, Apple Maps transit was also available in Baltimore, Berlin, Chicago, London, Mexico City, New York City, Philadelphia, San Francisco, Washington D.C., and 30 cities in China, including Beijing, Shanghai and Shenzhen. Maps were also added to Boston and Sydney in October. 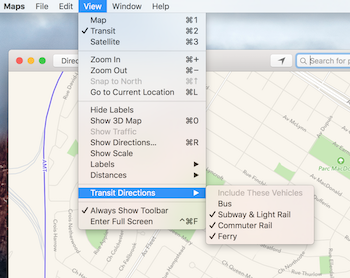 With transit, Apple Maps in iOS 9 offers routes, departure times and other relevant data for buses, trains, ferries and other forms of public transportation. The solution is akin to Google Maps, which has for years provided users with transit routing tools. In addition to local schedules, transit in Apple Maps gives users a top-down view of underground subway and train stations, a feature unique to Apple's service. Armed with track and time information, commuters can more efficiently plan their routes without getting lost. Further, data is customized for each location, meaning road signs are as they appear in real life. Apple's Transit feature is made possible by technology gained through key acquisitions like HopStop and Embark, powered by a multitude of data sources specific to each supported location. Yes indeed. Not so much for me personally but for friends and family. We did have some homegrown solutions for years but Apple's unique top-down view of underground subway and train stations, convenient for any city, is especially welcomed in Montreal, with one of the most extensive underground networks in the world, very appreciated due to our climate. This is fine and all, but there are several major cities that are neglected that should be top priority (IMO), European cities such as Paris and Rome to start. Interesting that this is a press release. I just assume it works in Google Maps. Most of these cities (including Montreal) use GTFS to represent transit information, so it's pretty easy to integrate. Maybe Apple found another way so they don't have to use Google open source solutions? And still no Tokyo—one of the world's largest cities with the most extensive public transit and the data is pretty much all open sourced too. What is Apple Japan doing with its time, other than overcharging for the iPhone SE? There's an Olympics coming in 4 years guys; pull your finger out and get coding. Wrong. The Maps rollout may be slow, but it is not steady. The rate has in fact been irregular. At the current speed it will take them nearly a century to cover as many cities as Google currently does. Same thing with flyover- three years later most places still aren't covered. Most place? You mean a desert? I love Google fan bitterness of Apple Map. Made my day while I continue using Apple Map daily with great experience. While it is nice that Transit is finally available here in Montreal, it is far from perfected. Unless I am missing something, it doesn't give you the best routes. For example: I want to go to a store downtown and I want to take the metro. Short of turning off buses, there is no way of indicating you prefer to take the metro. Fine, so it gives you the fastest routes and you can choose one that has metro or turn off Bus and have it include walking for 45 minutes to the metro station. The next issue is that it doesn't show you the best metro route. The Maps app seems to favor less transfers. But we all know that in cold weather climates there are some routes that include transferring to another line which are better because there is less walking at the end. There needs to be more options so we can map our journey the way we want to take it. So true. Living in Los Angeles it amazes me how piece-meal the transit data is in Apple Maps. Even though I try Apple Maps with each new upgrade, Google Maps is my choice. It just works. It is great that you can utilize Apple Maps. There are many of us who find it too limiting or incomplete. Glad we, Google Map users, can make your day. Would've been nice for you to mention that Google got at least a decade head start in mapping. Sort of like Samsung getting a decade head start in selling mobile phones...how'd that turn out? All things considered, Apple Maps is making impressive progress. Most of the options you seek are not in Google either, maybe some other transit app?